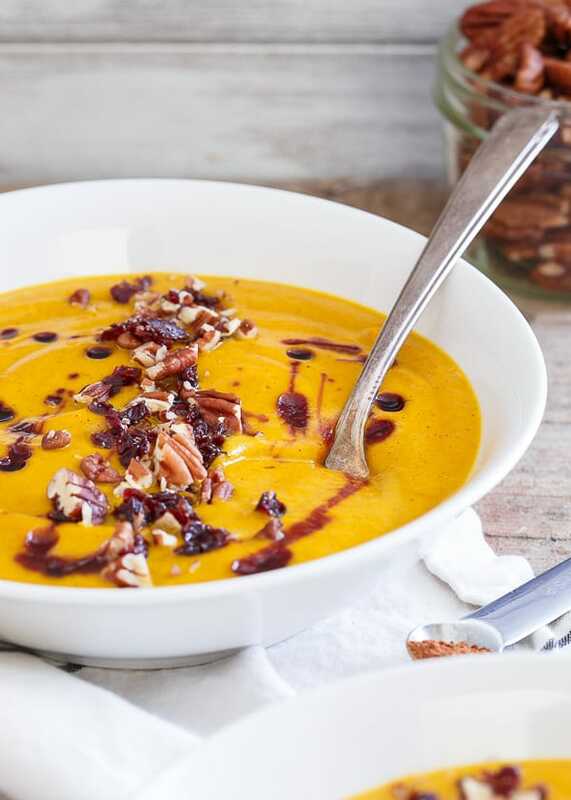 This creamy cinnamon ginger kabocha squash soup is topped with a tart cherry drizzle and pecan cherry crumble. Grab and bowl and get cozy! Julie and I are in Paris for a quick 4.5 days. It’s the most random trip ever (she entered a recipe contest on the spur of the moment, ended up being a finalist and then got to bring a guest for free to the cook off…in Paris) and after about 6 hours of sleep in the last 48, we’re back in our hotel room after a solid 6 hours of walking around the city and seeing some sights. -On the Pierre Hermé vs. Laudree macaron debate: Laudree is like the outdated classical cafe you’d find inside a snobby Sak’s Fifth Avenue with the all the usual flavors (although gingerbread was a delicious slightly out of the box flavor). Whereas Hermé is like the hip new chef in town putting foie gras (yes, seriously, we bought a foie and fig macaron) in your cookies. -When the weather says sunny and 60, it really means cloudy, feels like 50 at best and some occasional rain showers that will force you into a shoebox sized creperie for lunch wishing for a bowl of the cinnamon ginger kabocha squash soup sitting in your fridge at home, 3,500+ miles away to go along with your buckwheat, fried apple, goat cheese and ham galette and warm you up. I didn’t get my soup (or the special hot wine they advertised and then were out of when I tried to order it!) but the crepe was pretty killer. Pan fried apples…so much yes. 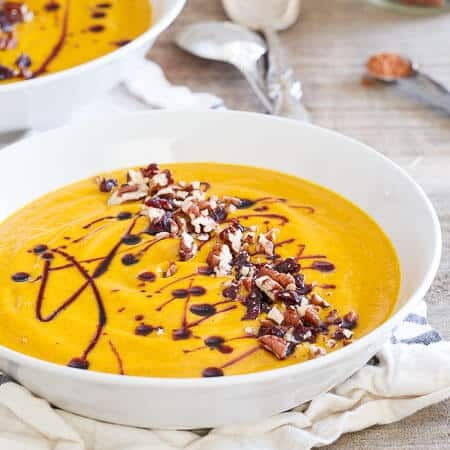 If you’re looking for that perfect fall/winter soup to warm you up though (in the absence of a cutesy Parisian creperie), I highly suggest this kabocha soup recipe. As I mentioned in this guide to winter squash, I’m obsessed with kabocha. It’s hands down my favorite squash of the season. Sweeter than butternut (and with half the carbs – yay for eating more! ), it makes the perfect creamy soup that pairs wonderfully with cinnamon and ginger. 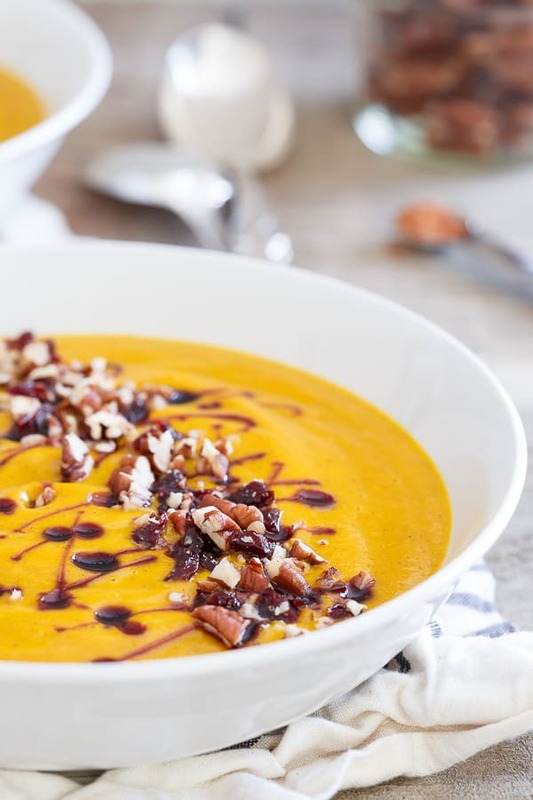 For more soups like this kabocha squash soup, try creamy carrot soup, coconut delicata squash soup. This copycat Panera tomato soup and this creamy broccoli soup are also decadent and delicious! Place squash flesh side down on a baking sheet and roast for about 1 hour, turn squash over half way through. Place a large pot or dutch oven over medium-high heat. Add coconut oil to the pot. Once coconut oil is melted, add onions and cook for 3-4 minutes until softened. Add garlic and ginger to the pot and cook another minute. Add the cinnamon and red pepper flakes, stir to coat then add the kabocha flesh (it should come right out of the skin after roasting) to the pot. Add the chicken broth and milk and stir to combine. Bring the mixture to a simmer and cook for about 5-7 minutes until heated through. Use an immersion blender or process in a blender in batches until smooth. Ladle the soup into serving bowls then drizzle with the tart cherry concentrate (about 1 tablespoon per bowl) and top with a pinch of the chopped pecans and cherries. Dear Gina, This soup looks beautiful and sounds wonderful. I could go for a bowl this morning! Beautiful soup. 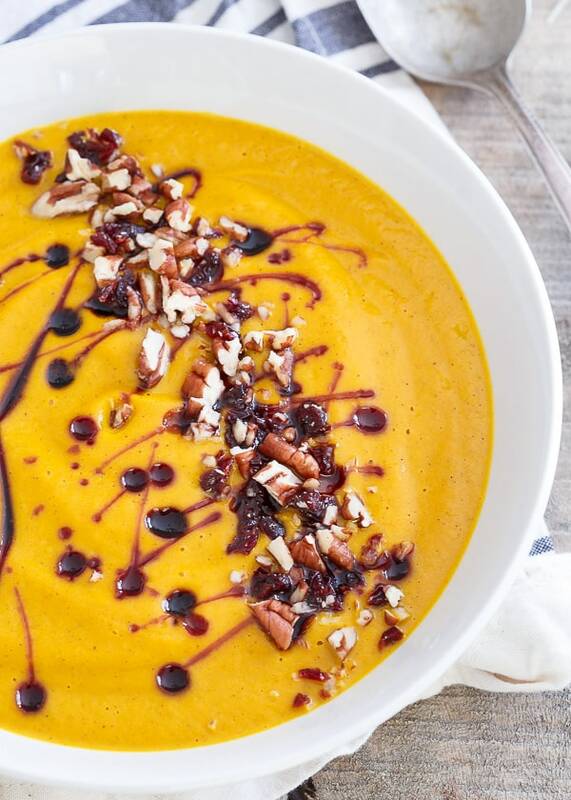 I love kabocha squash and your pairing with the cherries sounds incredible. Haha that’s exactly how I remember Paris weather. At least you have lovely food and wonderful shops to distract from the no-so-great weather. Soups like this are exactly what I need on a blustery day – beautiful! 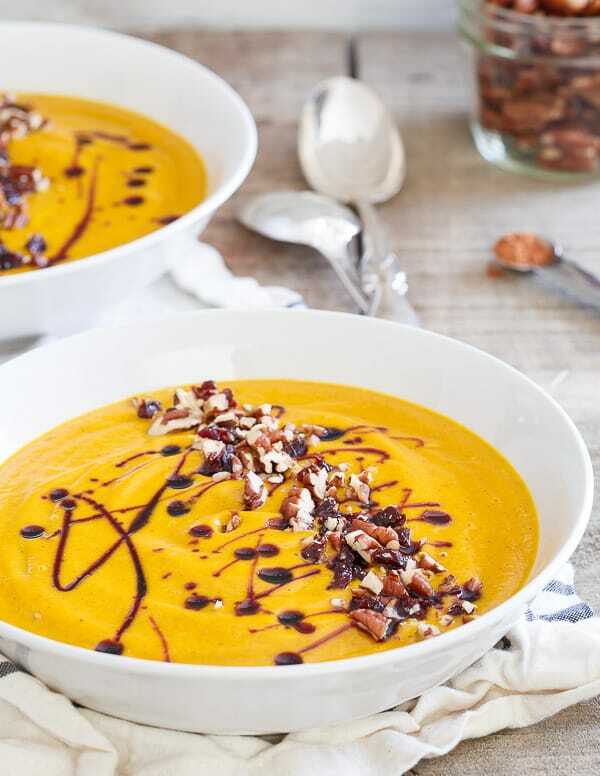 I love kabocha squash too and this soup sounds perfect for right now! The topping really takes it over the top. Thanks!